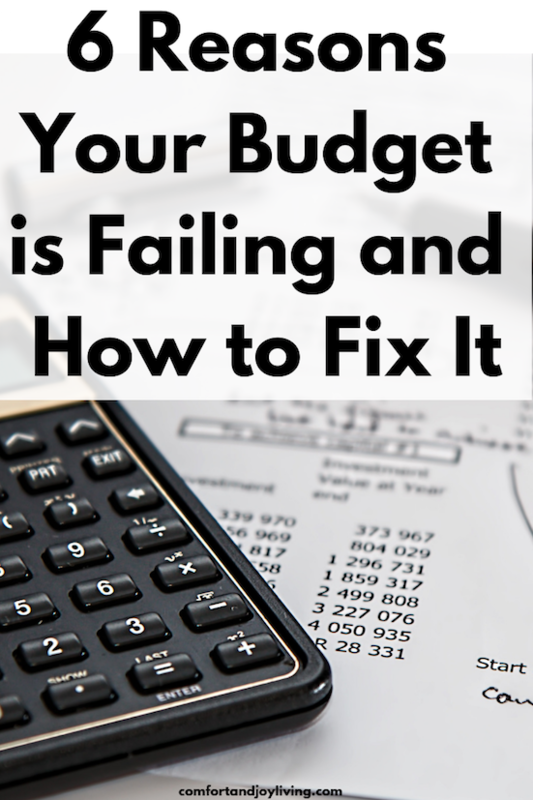 If you’re tired of going over-budget every month, make sure that you’re not falling into one of these budgeting pitfalls. Instead, try these 6 simple tricks to learn how to stick to a budget at last. There are about a million articles online about how to create a budget. (Yeah, I’ve even written a couple too.) But we all know that it isn’t knowing how to make a budget that’s the problem. It’s actually sticking to it—that’s the hard part! My husband and I have learned financial stewardship the long and painful way over the years. We made our first family budget around the time that our first child was born, made and fixed a lot of mistakes and learned a lot of tips to help us stick to a budget. Here are some simple tricks that we learned along the way that allowed us to FINALLY stick to a budget and pay off our debt fast. If you find yourself going over budget every monty, I can almost guarantee that there’s at least one of these six practices that you’re not doing yet. It’s never too late to start! Reason #1—You budget for a “normal” month. When I started my budget, I thought I’d do it once and then follow it every month, but guess what? That “normal” month never came. There were always things that were popping up outside of our regular monthly expenses that threw me over-budget. Here’s what I have learned to do instead. Rather than making a theoretical budget for the perfect month that, um, never actually happens, make a new budget every month for the month ahead. In other words, don’t make “A” budget, make a budget for January, a budget for February for February, and so on. This can help cut down on unexpected expenses because you only have to plan one month ahead. There’s no way that you can see all the unusual changes to your income and expenses that may happen this year. However, chances are that you already have a fairly clear picture of the month ahead. That’s what you should plan for in your monthly budget. This is especially true for energy bills that are sent the month or so before they’re due. You can also get a good idea of any upcoming medical costs when you receive your explanation of benefits ahead of getting the actual bill. This way, you an plan ahead for any “surprise” expenses for the upcoming month. Reason #2—You don’t budget every dollar. The concept of the zero-sum budget is simple, but effective. Your expected income should exactly equal your budget expenses. You basically tell every single dollar where to go at the beginning of every month. This emphasizes the fact that you don’t spend more than you make. It also ensures that if you do have some leftover cash, that it goes to something like paying off debt, savings, or retirement instead of an extra dinner out or into thin air. If you know that you’re going to have to spend more than usual on your energy costs, doctor visits, you’re moving, or your income will be less than usual, you an plan to spend less in other areas to make up for it. Reason #3—You forget to include commonly forgotten expenses. Don’t be caught by surprise. Plan head even for non-monthly expenses like new tires, school supplies and birthday gifts. Make sure to include commonly forgotten expenses in your budget. It’s my preference to put some money into a “sinking fund” every month all year long so that all of these non-monthly expenses are already “paid for” when it comes time to actually pay for them. For example, if you put away $8 per child into your sinking fund each month, you’ll have $96 ready to pay for back to school supplies in August. Save another $4 each month and you’ll be ready to pay for $48 of online tax prep when April arrives. This will save your monthly budget from taking a $50-100 hit every time of these unexpected expenses comes up. Do the same thing for your car registration, to help you with your Christmas budget, and so on. After all, none of these are emergencies and you ideally shouldn’t rely on your emergency fund to cover them. By planning ahead, you can eliminate all “surprise” expenses and stress from your budget. In other words, if the money isn’t there, it doesn’t matter if you think that you need something. It doesn’t matter if you know that you need it. You don’t spend the money, No matter what. Instead, get creative. Do you need to take a gift to a kid’s party? Look around your home for something that work work or make something. Kids outgrew their clothes again? Swap with a friend. Most of the time, looking back, you’l realize that it was a want and not something that you really needed. Reason #6—You don’t know where you’re going. Pinching pennies just for the sake of being frugal can be a little crazy, but that’s what so many of us do. One of my most popular posts is a list of 101 Simple Ways to Save Money. Everyone is looking for ways to save money, but if you don’t have a plan for the money that you save, what’s the point. Instead, start working towards a financial goal, such as getting out of debt, building an emergency fund, or putting money away for retirement. Make sure that it’s a clear goal with a specific dollar amount so that you’ll know when you actually achieve it. I can speak from experience in saying that it can be very motivating to see that loan repayment amount go down every month! It wasn’t until we set a goal to become debt free that we finally started staying on budget! What is your biggest challenge that makes it hard to stick to a budget?